Three-Grain Grilled Vegetable and Feta Salad | Naturally. During the warmer months, I could pack a lunch and head out on a picnic everyday. There’s a calm and centering that comes with laying out on the grass, reading a good book, and snacking on a spread of food (and trust me, there is always a spread.) Ever since moving to California, the locales vary. Some weekends we’ll pack up and head up to the mountains while the next we may head to the ocean or the redwoods. It’s good “soak up nature” time. I’ve never been a big fan of traditional picnic fare such as coleslaw and heavily mayo based potato salads (much to the chagrin of my husband.) Instead I pack snacking foods (olives, crackers, grapes, cheeses) and grain salads that are often thrown together based on what I have on hand at the time. These salads start with 1-2 grains I have cooked up, followed by veggies, herbs, a bit of dressing, and of course, cheese. I’ve said it before and I’ll say it again, I love cheese. For this particular picnic salad, I partnered with Président cheese to bring you one of my favorite salads. Even though there may be a discussion between my husband and I about what kind of salad I make, there’s one thing that is never a question: the cheese. During the summer salad months, we almost exclusively reach for feta. It crumbles perfectly and compliments almost any ingredient. 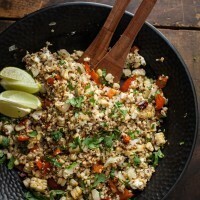 This salad uses three of my favorite gluten-free grains for a fun, nutty flavor and is balanced with grilled vegetables plus a bit of cilantro and lime juice. My favorite part? The Président Valbreso feta, a delicate yet wonderful sheep’s feta that blends right in with the mix of grains. Of course, we would gladly eat this salad with traditional Président feta as it would be just as great. 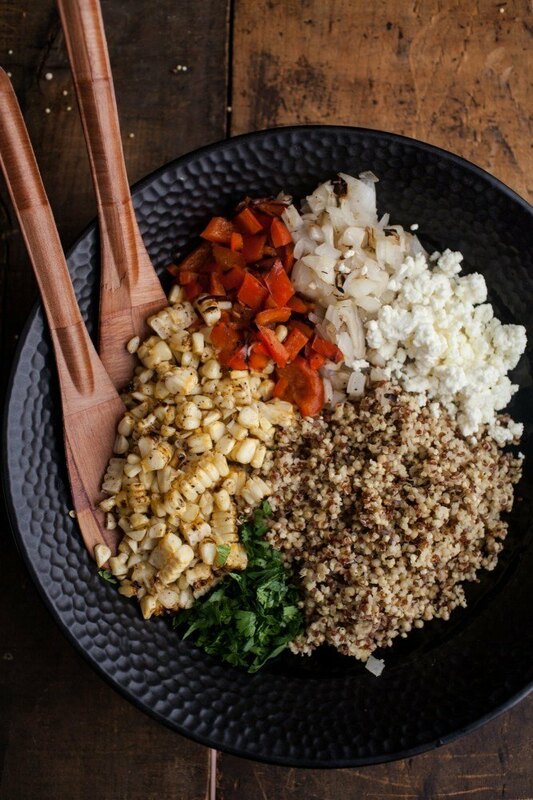 Don’t let the grain cooking time make this recipe look difficult. The sorghum takes nearly three times as long as the other grains but is well worth the wait. Feel free to play around with the amounts of grains used. This salads makes a hefty amount and is great to keep around for a week of lunches. I’ve also been known to throw black beans into the mix. In a pot, bring water and vegetable broth to a boil with a pinch of salt and olive oil. Stir in sorghum, reduce heat to low, cover, and let cook for 30 minutes. 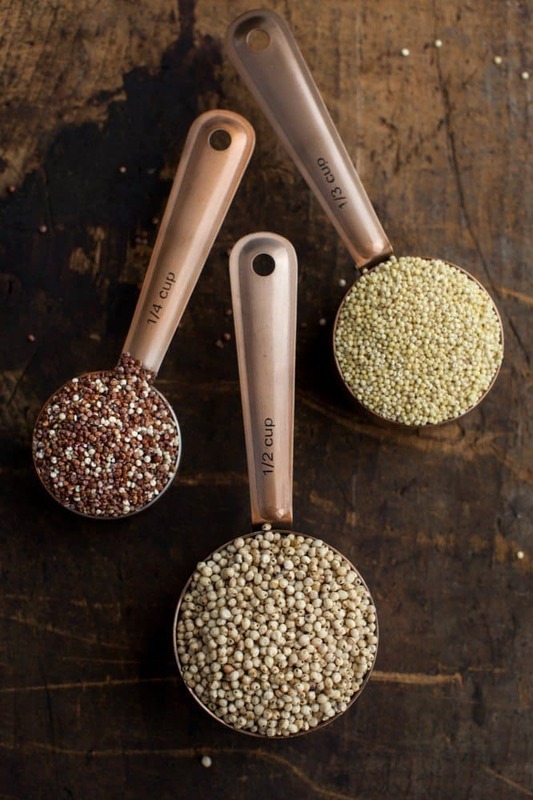 Stir in quinoa and millet, cover, and continue cooking for another 15 minutes, until water has been mostly absorbed. Test the grains and if they are still chewy, add ¼ cup of water and cook for another 1-2 minutes repeating until the grains are almost tender and still a bit of moisture left in the pot. Remove from heat and allow to rest, covered, for 10 minutes. Light grill to medium-low heat. Cut sides off the pepper and onion into ¼” slices. Shuck the corn and remove any silk still attached. Rub each ear of butter with 1 tablespoon of butter and sprinkle evenly with black pepper and smoked paprika. 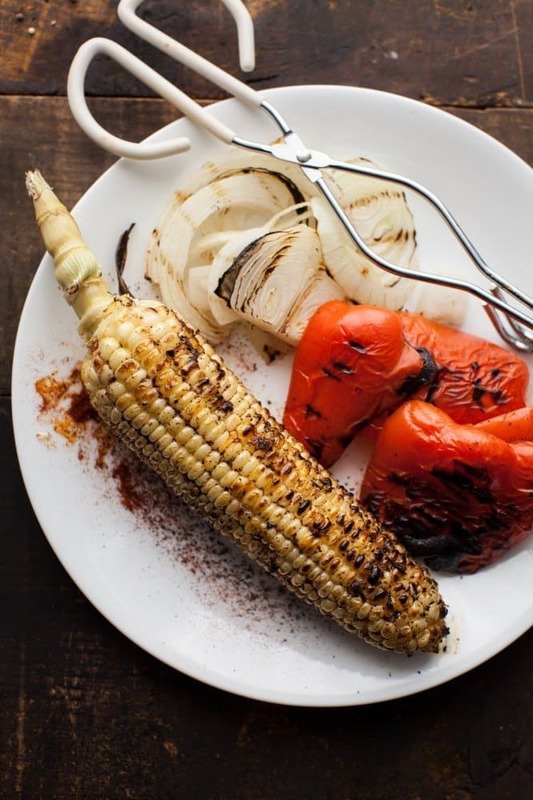 Grill, turning vegetables occasionally, until charred on all sides. Remove and let corn cool slightly. Carefully remove kernels from cob. 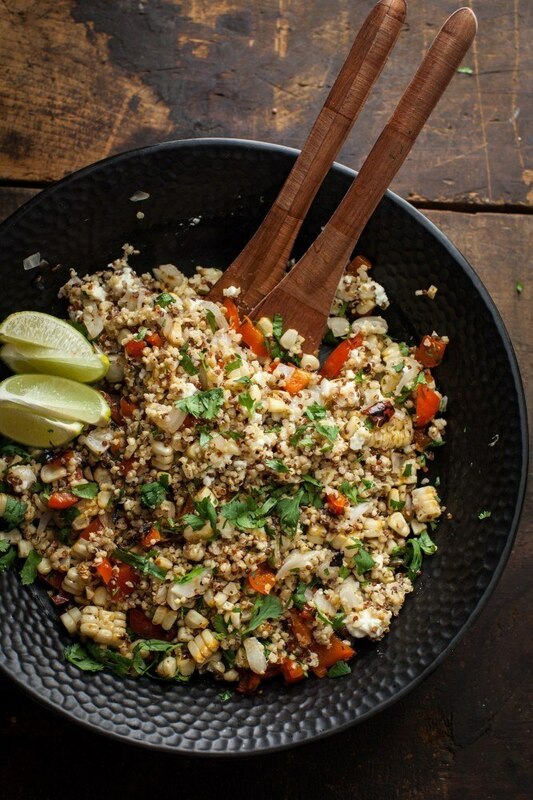 In a large bowl, combine cooked grains, grilled vegetables, feta, and cilantro. Combine olive oil, lime juice, salt, pepper, and honey in a small jar with lid. Shake well and pour over salad. Toss until everything is combined and well coated. Serve with extra lime wedges if desired. this looks perfect for lunches and picnics, super delicious ingredients and healthy – i’m all for this ! This salad is total summer in a bowl!! Love it! GRilled vegetables with feta is always a winner! Sooo delish.. Thanks for sharing! Oh wow – this recipe just ‘sings’ to me to make this weekend. I just so happen to have small amounts of those three grains, and this is the perfect way to use them. The pictures are beautiful, thank you for the inspiration! This looks like the ideal summer picnic salad. And the grain combo is fantastic, especially since it cooks in one pot. This looks wonderful! Love this take on a healthy summer salad! Holy moly this salad looks ah-MAZING!! Love it. My picnic ‘menu’ looks very similar – snacks and nibbles and maybe a small sandwich or cheese + cracker spread. And I’ve been finding myself reaching for feta more often recently too! It’s the perfect flavor blender in the summer! Three grains! Because one just wouldn’t be exciting enough. 😛 I love summer salads like this. They hit the spot! This is making me want to go out and by a grill ASAP. If I can’t find sorghum anywhere, what would be a great replacement for that?? It looks so delicious! Oh, how I envy you being able to get sheep milk feta… Even though we have the brand, we only can find the cow’s milk variety. This salad sounds scrumptious, and I agree with you that cheese – especially feta – makes just about any dish. This looks wonderful. Feta cheese is my favorite – I wish it were easier to find sheep’s milk feta where I live. 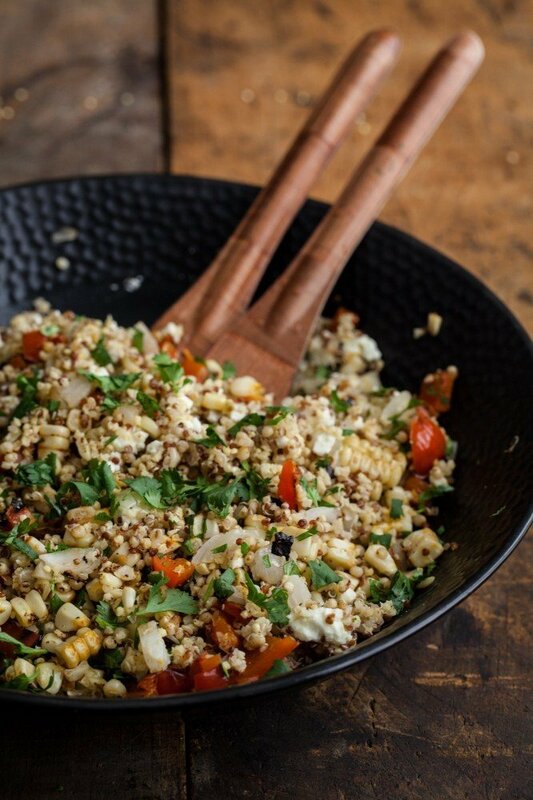 I’ve fallen in love with whole grain salads, so I will be making this one.